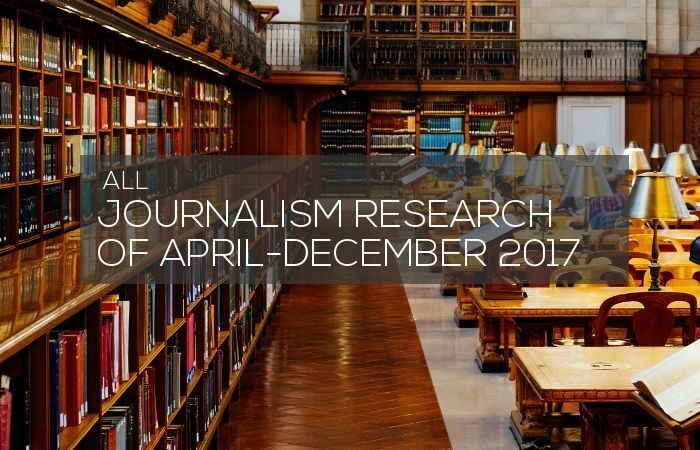 Here is an almost comprehensive list of all academic peer-reviewed articles, reports and other papers about journalism research, published between April and December of 2017. The bolded titles link to JRN articles written about the studies. However, the list is not perfect. It lacks the first three months of the year, since we only started collecting the data systematically in April. Some journals and other sources were found over the year, so probably this list misses some of the earlier articles from those journals. You can search and filter the table by authors, titles, journals and publication dates. 2017-05-22 "You Can't Post That!" 2017-05-22 Propaganda, Persuasion, or Journalism? 2017-06-28 Maybe Things Aren't So Bad, or Are They? 2017-06-29 From a Friend: You've Got to Watch This! 2017-07-11 Churnalism on the Rise? 2017-07-11 Visualization, Technologies, or the Public? 2017-07-13 News Wholesalers as Churnalists? 2017-07-25 Pressure to Publish or Saving for Print? 2017-07-06 Burst of the Filter Bubble? 2017-08-09 Are Newsgames Better Journalism? 2017-09-18 More of the Same? 2017-09-28 A Badge of Honor? 2017-10-07 Dialogic journalism: how can journalists participate in the networks of social innovation? Taneli Heikka Doctoral thesis, University of Jyväskylä. 2017-10-10 Was Sky News softer on Qatari affairs due to Qatar Airways' sponsorship of Sky weather reports? 2017-10-10 The People Have Spoken (The Bastards? ): Finding a legitimate place for feedback in the journalistic field Andrew Duffy, Rich Ling & Edson C. Tandoc Jr.
2017-10-12 Data-driven reporting: An on-going (r)evolution? 2017-12-06 Has Digital Distribution Rejuvenated Readership? Evidence from the consumption of fake news during the 2016 U.S.